I tried to resist hammering away at Ray Rice’s domestic assault episode and his two-game NFL suspension since I think many other people made valid points. Hold on. “Learned from this”? What lesson did Janay, THE VICTIM, learn from this? That she now has solid confirmation of her five-foot, eight-inch, 206-pound professional running back of a husband’s ability to knock her out? That she can’t stand up to his straight right? Or left? That he either can’t lift her from the floor when she’s unconscious, or he had every intention of dragging her limp body out of the elevator where the alleged beatdown took place? 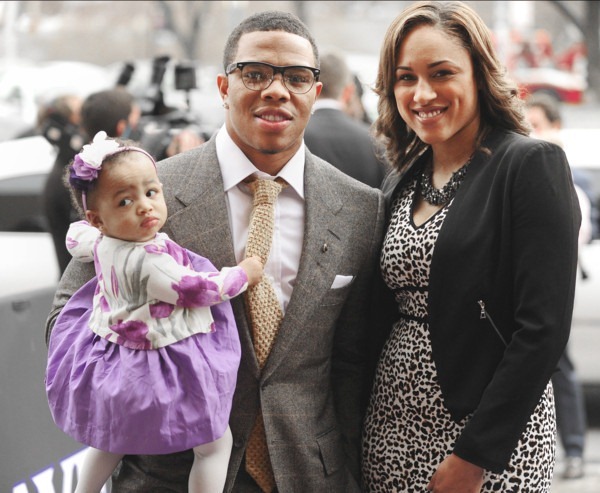 That Janay, who was Rice’s fiancé at the time of the knockout, should have thought long and hard about marrying him? That whatever her abusive husband thinks about The Lesson she’s supposed to have learned reflects his inability to accept sole responsibility for knocking her out, which is a trait of an abusive personality disorder? I hope the Rices never have to see another violent episode, but based on Mr. Rice’s quote, what does your crystal ball say? This entry was posted in Sports and tagged baltimore ravens, domestic abuse, janay rice, nfl, ray rice. Bookmark the permalink.